Thank you for taking the time to view our Miracle Ministries web site. We sincerely appreciate you taking time out of your busy schedule to look at this active, anointed website. Miracle Ministries is multi faced organization with its headquarters at Kadali, East Godavari District, Andhra Pradesh, India. At Miracle Ministries we are passionate about the great commandment - Loving God and loving people and the great commission - teaching the Word and making disciples." Shravan was born into a family rich in Christian heritage. His parents Joshua and Sarojini Joshua were well respected and recognized as Christian leaders. various Churches, crusades and seminars in India, USA, Canada,Bahrain, Oman, Kuwait, UAE and Israel. Postgraduate in English literature, Bachelor of Education, Post graduate diploma in the teaching of English, and Able Minister's diploma from IOM, Florida. Shravan holds ministerial credentials with Global Christian Ministry Forum as licensed minister. 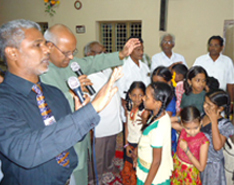 Founder of Miracle Ministries Shravan established Churches in Kadali and Vijaywada, oversees feeding programs, children's homes; provides leadership to many churches. He is also involved in various philanthropic works. He and his wife Sandhya have a son Joshua and a daughter Suzy. Sandhya was also born into a family rich in Christian heritage. Her parents are esteemed and acknowledged as Christian leaders. Sandhya's non–denominational and non-sectarian approach has opened doors to minister in various Churches, seminars and crusades in India, UAE, Israel and Canada. She helps in overseeing feeding programs and children's homes. She is also involved in disaster relief programs.